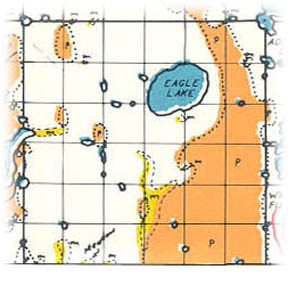 The township of Eagle Lake (township 131, range 40) was organized on September 5, 1870. The first election was held at the house of Lars Hernes, September 24, 1870. The petition for the organization of this town ship bore the date of August 9, 1870, and carried the following signers: Carl Torgerson, John Peterson, John Hagensen, Stephen Tyllam, Joseph Marcott, Ole J. Guldseth, O. Olsen, Lars Halversen, Peder Nilson Kjosnis, L. W. Weaver, Ole Hermansen, Nils P. Rosfmusen, Peer Jacobsen, Ole Perfen, L. L. Hermees and Tosten Norijen. Evidently the township did not take on a definite organization until after March 15, 1871, as shown by the following records in the commissioners' minutes: "Ole Hernes, being duly sworn, on oath says that the town of Eagle Lake refused to organize and elect town officers at the time fixed by law for holding their town meeting, and that no notice of any twelve freeholders has been posted to call a special town meeting for said town within thirty days after the annual town meeting. "O. H. HERNES." This report to the commissioners resulted in the ordering of an election at once, and, with the qualifying of the officials thus elected, the township formally began its career. Being one of the earliest settled townships in the county, it has many well-improved farms. The nearest approach to a village which the township has ever had is found in the eastern part of section 17, at which place a postoffice by the name of Hoff was maintained for many years. Here was the first store, grist-mill and blacksmith shop, but the embryonic village failed to grow. The fact that no railroad has ever invaded the quiet precincts of the township is another reason why no village has ever been established. Places of birth for Eagle Lake Township in the 1905 state census.